Hair can be one of a woman’s most precious assets. We understand that it can be frustrating and emotionally difficult when your hair starts to thin or fall out. At Aesthetic & Dermatology Center, we have offer PRP, a women’s hair loss treatment, to help restore your hair. This innovative PRP hair treatment for women can be applied to many different types of hair loss, baldness, or alopecia. Many women experience hair loss. Read more about what causes female hair loss, below. How can Aesthetic & Dermatology Center help you today? Why Choose Aesthetic & Dermatology Center For PRP Treatment For Hair Loss? At Aesthetic & Dermatology Center, we stand behind every treatment that we perform, and helping you love the skin you’re in is our passion. If you’re suffering from women’s hair loss, we have the latest technologies and an abundance of compassion to get you back to living your best life. We understand how distressing hair loss can be, and we have the solutions you’ve been hoping for. Call Dr. Lawrence Green, Rockville and the DC area’s leading dermatologist, today to see if PRP hair loss treatment is right for you. One of the hair loss treatments that we are proud to offer at Aesthetic & Dermatology Center is PRP, or platelet-rich plasma treatments. PRP for hair loss is a serum made from your own blood, and the plasma contains growth factors and bioactive proteins that aid in stimulating the hair follicles and restoring your hair. Platelet-rich plasma contains up to five times more plasma than in regularly circulating blood. Because PRP triggers your body’s natural healing response, it is effective in promoting hair growth. PRP treatment is widely used in other medical specialties such as orthopaedics because of its restorative and healing capabilities, and its effectiveness is one of the reasons we offer it as a treatment for women’s hair loss. Many women start to notice hair loss because of thinning wispy hairs, a widened hair part, or a thinner ponytail. Female hair loss is relatively common and can be a result of genetics, environmental factors, and/or even daily habits. Female pattern hair loss (female pattern baldness) is the most common type of hair loss women experience. As the name suggests, it is a genetic type of hair loss, and it only affects the hair on your head. This is the most common type of hair loss that Dr. Green treats; if you’re ready to take the next step and start restoring your hair, call our office today. Stress can have an incredible impact on our bodies, and, unsurprisingly, can cause hair loss. Events like grief, sudden weight loss or gain, or even childbirth can cause hair loss. Stress is hard on the body. When stress causes your hair to thin or fall out, don’t add it to your list of stressors. Come see Dr. Lawrence Green at Aesthetic & Dermatology Center. Putting your hair in a ponytail or bun can be incredibly convenient on windy days, for work outs, or pretty much any time. However, when hair is pulled in one direction for long period of time, it puts constant and prolonged stress on your hair follicles. As a result, you may begin to see your hair line recede. People who frequently sport a ponytail, hat, or helmet are more likely to experience this type of hair loss. Hormonal imbalances, metabolic issues, and thyroid problems can all contribute to hair loss. This is your life; live it the way you want! If you want to know more about hair loss treatments that can help you regrow your hair, call Rockville and the Greater DC area’s leading dermatologist at Aesthetic & Dermatology Center for a personalized treatment plan. 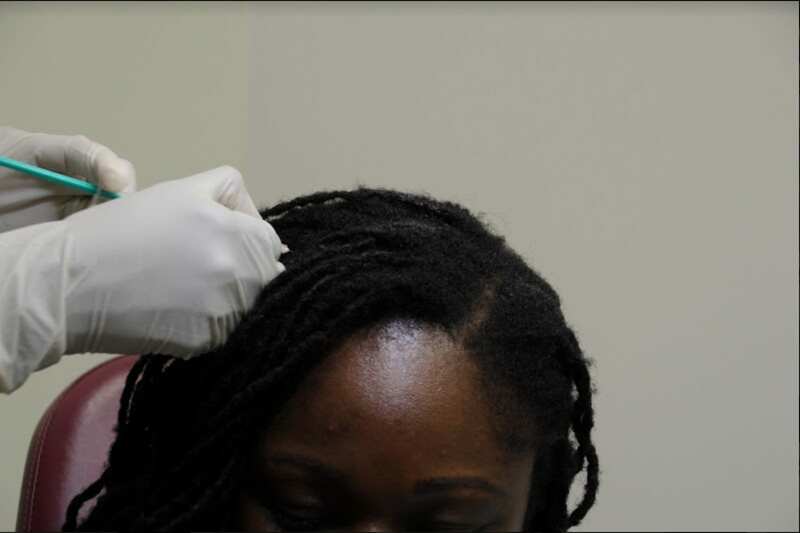 If you’re experiencing female hair loss and are ready to take the next step towards restoring your hair and your confidence, call Dr. Lawrence Green at Aesthetic & Dermatology Center today at (301) 610-0663 to schedule your appointment, or you can request an appointment online. Click on image to enlarge or zoom in.